Some trifectas are worth celebrating. Others maybe – not so much. This is my third contribution to this august forum. All three of them have been about a Battle of the Felines – the last three clashes between Geelong versus Richmond at the MCG: the first was a final, the second in inverted commas a “Geelong home game”, and the third last Friday night’s game at the venue where Richmond had won about fifty (well, OK, at least eighteen) games straight. 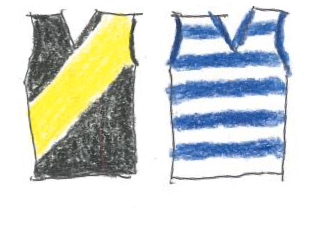 I wrote all three from the only perspective I can manage – sixty plus years as a Geelong supporter, which probably means that I might be getting old. I approached all three games with genuine hope, and even confidence. And, OK – all three times I left the ground bemoaning a loss. This time, though, there were a few points of difference. Last year’s final was a developing horror show – the Tigers up by 12 at quarter time, by 9 at half time, by 13 and still gettable at three-quarter time … and by 51 at the end. A crushing 7.3 to 1.1 last quarter confirmed to sceptics like me, of whom I suspect there were many, that this Richmond mob might be, inconceivably, the real deal: that the perennial disappointments, the club that made ninth position a home away from home, could with an ounce of luck actually win the thing. The rematch in round thirteen of this year featured, in the yellow and black corner, a team now unchallenged as the best in the competition. A manic game plan that, like the Doggies’ in 2016 before them (we don’t have two key forwards? Cool – let’s improvise with fanatical little guys!) had been born of a stroke of genius heavily leavened with serendipity, and had created a wild momentum, suddenly seemed sustainable. Unlike the Dogs (and blessed with a rare freedom from key losses to injury, and a confidence bred from continuity), the Tigers were hot favourites for the flag, and looked unbeatable at the MCG. That fourth quarter that had swept Geelong aside had now become a signature move – the juggernaut would roll after the orange break, even if it had been slow to get going. And as for the contenders in the blue and white corner, they were absolutely a work in progress. The leg speed issue so apparent in the Qualifying Final had been addressed, but was the quality really there? And the Geelong backline of venerated veterans had transformed into a new blend, led by a steeplechaser, a builder’s mate, a very junior decathlete … and an Irishman? A premiership outfit with amazing stability both in its personnel and its systems was matched against a side still trying to find its way. And yes, the result was the same. Not quite so devastating, but definitive enough. This time the Cats were ready for the early onslaught, and led by 15 at quarter time. Richmond were in front by two points at half time, and by one at the end of the third quarter. The game was up for grabs. And then Richmond kicked 4.3 to 1.4 in the final quarter. Sure, the Geelong boys blew some chances, but the moral was clear. When the Tigers need to get it done, they do. Last Friday might look like an encore. The Tigers won, as they do. But several things broke the pattern. The margin was just three points, which neatly maintains the numerical motif of this article; and if Gary had just kicked that goal with a minute to go, swinging wide onto his right foot in that characteristic and – let’s face it – bankable way, it would have been three the other way. This time the Tigers led by 10 points at quarter time, 5 at half time, and 21 at three quarter time. It looked ominous – the Tiger tsunami was all set to go, as usual, in the final quarter. But it didn’t quite follow the script. The Cats kicked 5.2 to 2.2, including the last three goals of the game. They coulda, maybe shoulda …. But every Geelong supporter, and perhaps a few of the less triumphalist Richmond ones, left the MCG that night pretty sure that “the Cats can get ‘em next time”. And that possibly deluded confidence was built on more than the steady closing of the gap over those last three battles, and even the knowledge that this one could so easily have gone the other way. It was founded on the belief that the Tigers are still, very impressively, the side they were twelve months ago – the same players with the same game-style, overlaid perhaps with enhanced self-belief verging on entitlement. The Geelong side they beat is a team in evolution, and getting a little better all the time. But more than that, this was a Geelong side that was starting to develop some continuity and cohesion of its own, and even a belief in its conceivable destiny. Ridiculous, from any rational point of view – they may never get another crack at the champions this year, and might even miss the final eight. But football is not always a rational game, as the last two unexpected premierships might suggest; and evolution is a powerful force. Richmond the reigning champs are wonderfully predictable – in their level of performance, their structures, the roles their players play and their expectations of each other. Most teams aim for that kind of predictability – and they are a terrific team. But predictability is a mixed blessing. In life it’s usually a bit of an Alexander Downer, associated, perhaps unfairly, with the boring and uncreative. And in football it has the great virtue that your players always know what they’re supposed to do, and the great disadvantage that your opponents know exactly what to expect. So when Geelong tossed aside the go-wide-slowly strategy that had mostly worked so well against ordinary sides over the last five years or more, and replaced it with a version of the we-will-own-the-corridor bravado that its better-equipped teams had dared in 2007-9, there were a few surprises. That well-drilled Richmond defensive wall was breached, right through its middle, at various points through the game but especially in the last fifteen minutes. The Tigers’ invincibility, especially at home, was suddenly in question; apparently they don’t always win last quarters at the G. And while Richmond may well go back-to-back, Geelong and every other notional contender now knows they can be beaten – and how to do it. It will be a very interesting final quarter, the last one of 2018. But back to threes. The first of the three conclusions to be drawn from Friday August 3 (that number again!) was the one above: Richmond are good but gettable, Geelong might go a long way in the finals if they can just make them, and the team that beats Richmond will have to play bravely, unpredictably – and very, very well. The other two conclusions are about the game, and don’t have much to do with one-eyed perspectives. One concerns its attractiveness and viability: this game, and all but one of the games on Saturday, were great spectacles and closely fought. Tigers by 3, Hawks by 4, North by 3, Crows by 3, Swans by 2 … so very nearly (and on average) a great day for 3. In a time when there’s lot of debate about its watchability, this was (to that point) a very reassuring round. I didn’t see much of any of those other cliff-hangers, but – in the game I saw – two radically different game-styles went toe-to-toe right down to the wire (and yes, there’s something about football that leads inexorably to cliché). At the MCG, after a fair swathe of drizzle and on a night even colder than it felt up in Q48, two good sides produced a level of skill that befitted a balmy night in late September. So at the upper end, competitiveness is still alive and well. Then four games blew that pleasant thought out of the water – Saints down by 35, Blues by 105, Suns by 96, Dockers by 58. Not everything in the bower is rosy, and the game still faithfully reflects society’s persistent preference for the haves over the have-nots. But still – the game is not quite as deeply in the mire as its more virulent critics like to say. And one of the reasons for that is that there continue to be good – even romantic -stories. My third conclusion from Friday night is – just how good is Tim Kelly? He’s a beautiful player to watch – both hard at it inside, and immensely skilled outside. It’s an eternal mystery that he missed being drafted until Geelong grabbed him at pick 22 (?) last year. He’s played every game in a midfield that’s a galaxy of stars, and there’d be very few weeks in which he hasn’t been in the best half-dozen. We need to celebrate the fact that the game is not as bad as it sometimes seems, that the premiership might be much less predictable than we thought. And we – all of us, not just Geelong tragics like me – need to celebrate Tim Kelly. Some players just bring to the game unqualified joy. Kelly is one of them. Inevitably the comparisons that come to mind are with other indigenous players with inexplicable flair … He plays low to the ground, and he can run like that full tilt; his hands are astonishingly clean. And he has a killer shimmy that gets him through traffic where no ordinary mortal could possibly find a way. I’ve been trying to think of comparisons. Among Geelong players Ronnie Burns maybe? … but he was such an outside player, and was cast in the role of goalsneak. Barry Cable, certainly; and the Krakouer brothers, of course … It’s a very rare kind of talent, and a treasure of the game. He wasn’t quite Geelong’s best player on Friday night – Joel Selwood played a game of unrelenting purpose, constant inspiration, and awesome efficiency. And Mark Blicavs (who really should by now be defined as the exceptional key defender he has become, and not as the very good steeplechaser he once was) was exceptional; why the hell wasn’t he on Riewoldt, or is that a tactic to be revealed in some hypothetical next time? But Tim Kelly. The game should celebrate slightly late bloomers like this man. At the grand old age of 23 he is too old be a ‘Rising Star’. But he is one, you bet he is. Anyway. For my club, guys like Kelly (and the magnificent Tom Stewart, and Sam Menegola) who have found their way around the system at the age of 23 have been a blessing. Let’s celebrate them (and, to be more inclusive, Kane Lambert, and Brodie Mihocek, and Bailey Fritsch) as players who took the path less predictable. Who knows? – it might just be the way to the grail. Let me finish with a question/challenge for all our readers. Has any first year player made a more striking and sustained impact than Tim Kelly? …. Nope. Except maybe his captain? Hi Peter. Love reading your pieces on Balcony Banter. Don’t listen to Harms, keep writing. Love the pieces AMD the results of the games. We still owe the Cats quite a few more. Yes I give you the name JACK GRAHAM. Oh the blinkered view seems to overlook that Richmond dominated the inside 50’s, had more shots on goal and more scoring shots. Just like the GWS v Richmond game, both could so easily have been six goal wins to the Tigers. Next time the Tiges will be ready for the centre corridor or anything else that might be tried. Just you wait and see…….